We may feel that in seeing the movement of an object we are conscious of the object's movement. Actually, however, in a sport where instantaneous judgment and movement are required, we do not have time to think consciously about the object and react. Then how can the body react? 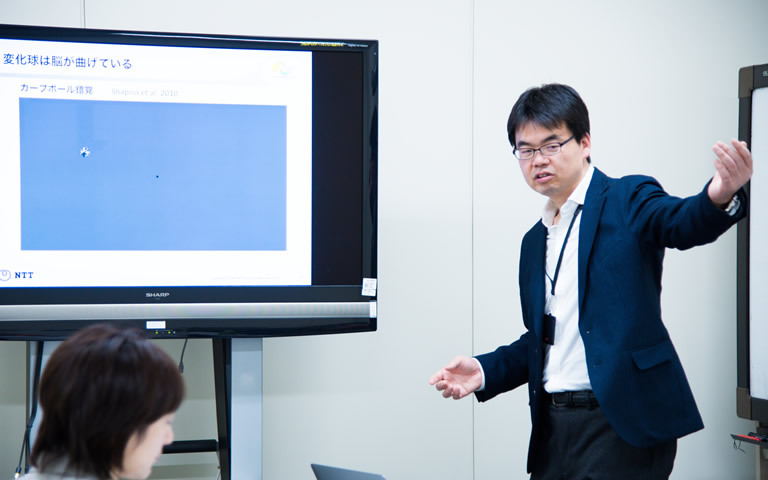 Dr. Makio Kashino, Head of NTT Sports Brain Science Project, talks here about the importance of knowing the characteristics of vision, such as illusion, while investigating the brain’s visual system. Why doesn’t the baseball player Ichiro Suzuki wear contact lenses? —As you have already said, in sports, ‘implicit brain function’ is essential to the control of unconscious and automatic movement. Here, in relation to sports, we would like to dig deeper and hear more about the relationship between the brain and sports. 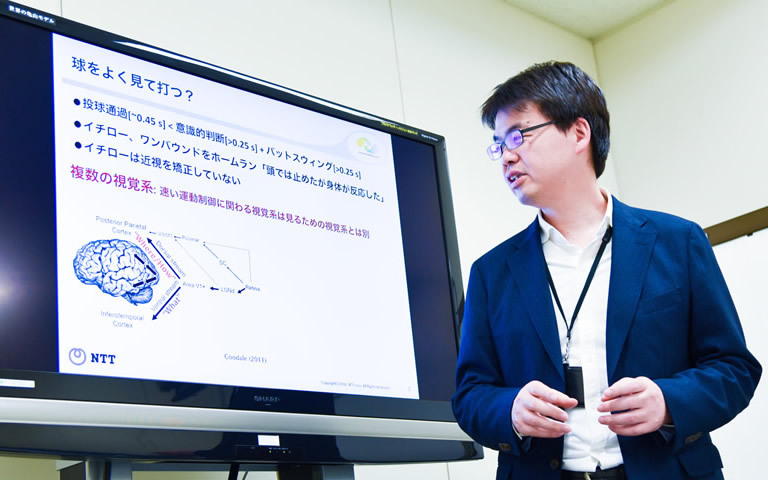 Kashino: For example, 'seeing' even just one thing is a result of complicated processing by the brain. So, today I would like to talk about vision. However, this is rather complicated and is not easy to do. In baseball, batters are often told, ‘Keep your eye on the ball and hit it.’ However, in the first place, if you try to hit the ball while watching it come over the plate at a speed of 150 km/h, you will never hit it on time. It takes about 0.2 to 0.3 seconds of processing for your eye to see the ball, and after that it takes about the same time to swing the bat. At this speed of response, the ball will have already gone by when you swing. So, how are we able to hit the ball? What’s important here are processes that are not conscious, but belong instead to our implicit brain functions. There are two things that are likely related here. The first is that our body moves automatically when it receives visual information, and the second is that we predict the path of the ball. This includes not only prediction of the ball’s trajectory immediately after the pitcher releases it, but also prediction based on the pitcher's form before he throws the ball. It happened once that Ichiro got a hit from a ball that came to the plate on one bound. In a post-game interview Ichiro remembered this and answered, "In my head I tried to stop my swing, but my body went ahead without permission and hit the ball." The processes of implicit brain functioning are so rapid that they work faster than consciousness. Another interesting thing about Ichiro is that he does not wear glasses or contact lenses to correct his vision. Tetsuto Yamada of the Tokyo Yakult Swallows is said to have vision acuity worse than normal (20/20), but he does not use glasses for visual correction. It is said that a doctor once recommended that Ichiro correct his vision, and he tried using contact lenses; however, he immediately stopped using them after trying them out. Ichiro said then, “For example, if it were a contest to read words that the pitcher had written, contact lenses would be necessary, but that’s not what baseball is all about.” In other words, Ichiro and Yamada both know from their own experience that being able to see the ball clearly and being able to react to the ball are completely different issues. If we train our kinetic vision, will it improve our sports performance? —It is often said that training your kinetic vision is good for improving your performance in sports, isn’t it? Kashino: It’s not really that easy. I would like to talk about that a little from the viewpoint of neuroscience. Actually, there are several pathways that are taken for processing the brain’s visual information. First, when the retina of the eye receives light, the light is converted into an electric signal and transmitted through the optic nerve to the lateral geniculate body in the optic thalamus of the brain. And, information is transmitted from the lateral geniculate body to the primary visual cortex (V1) in the occipital lobe. From there, it goes mainly through two pathways. As a result, sometimes, strange things occur. For example, if the dorsal pathway of the brain is destroyed due to something such as a cerebral hemorrhage, color and shape can be recognized, but movement cannot. This is a neuropsychological disorder called visual kinetic blindness (akinetopsia.) People with this visual disability will spill tea over the brim of a cup when pouring the tea into the cup from a teapot. Such a person cannot stop pouring the tea at the proper place because the person cannot see things in motion, but only sees them as if they were watching a movie one frame at a time. Different pathways of the brain are responsible for understanding shape and color and seeing movement. Well, then what is important in sports is the dorsal pathway's ability to see and process movement. However, the visual system that captures this movement is not simple. This is because the vision that generates body movement according to the motion of an object and the vision that generates the consciousness that "the object seemed to move" are also divided. There are various kinds of vision for generating bodily motions. One of these is the Manual Following Response (MFR) discovered by Dr. Hiroaki Gomi of our research department. In an experiment, subjects were given the task of stretching their hands out to reach a target. 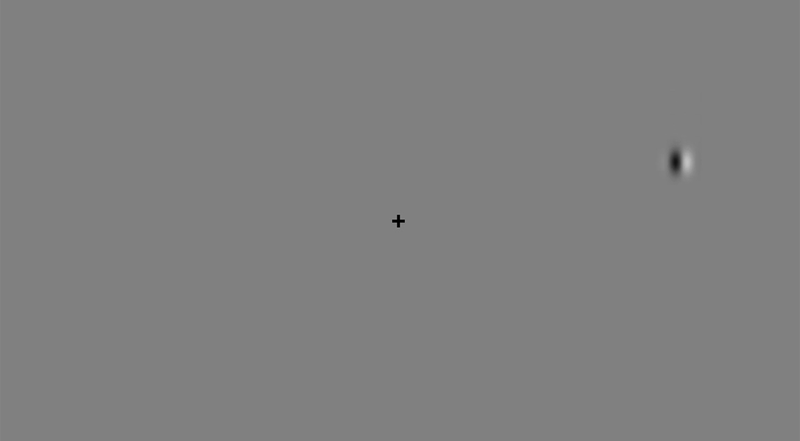 In the middle of this task, the target did not move, but the whole background suddenly moved in one direction. Interestingly, the subject’s hand was influenced by the moving background, and it moved unintentionally as the background moved. Even if a person consciously tried not to let their hand move, the hand would inevitably move as the background moved. When the participants in the experiment were asked why they kept moving their hands, they said they hadntentionally but felt like their hands were being pulled by someone. According to Dr. Gomi, the involuntary hand movement started not moved i less than 0.1 seconds after the background started moving. On the other hand, when the subjects were told to move their hand and respond as fast as possible when the light came on, the time it took for the subjects to begin to move was 0.2 to 0.25 seconds. This is called voluntary movement, but reflexive responses like those in MFR are much faster than that. —That shows precisely the working of implicit brain function, doesn't it? Kashino: Yes, it does. Moreover, interestingly, when the pattern of the background is coarse (low spatial frequency) and moves quickly it is easier for the hand to be affected by the background. And even when a background with a fine (high spatial frequency) pattern moves slowly, the hand is not affected much. In contrast, what can be clearly seen to move is when the fine pattern moves slowly. We understood that even though the subject can catch the target with one grab, the mechanism that triggers this implicit reflexive grasping is different from the mechanism that acts by coming to the surface consciously. By the way, although our preliminary talk has been a little long, I would like to get back to the question of whether we can expect to see improvement in our ability in a sport if we train our dynamic vision, and my answer is that it is not that easy. It depends on what you want to do with dynamic vision, and if you are just going to train to read small letters that suddenly appear in various locations, then in regard to movement, you probably will not be able to train yourself so that your body responds well to movement. It is better to train your ability to respond quickly and move properly, even if what you see is blurred, rather than train to improve your ability to see more clearly. —Actually, I have lost the center vision of the right eye due to retinal disease, but since then I have been surprised at my ability to instantaneously grasp anything that falls from the shelf. Kashino: That’s exactly right. Central vision has high spatial resolution, but sensitivity to motion is relatively low. On the other hand, your peripheral vision is blurred, but you become more sensitive to movement. In sports, it is more important that you see peripherally rather than see everything in your central field of vision. In sports such as soccer as well, the breadth of vision and ability to see the movements of players around you are extremely important, aren't, they? 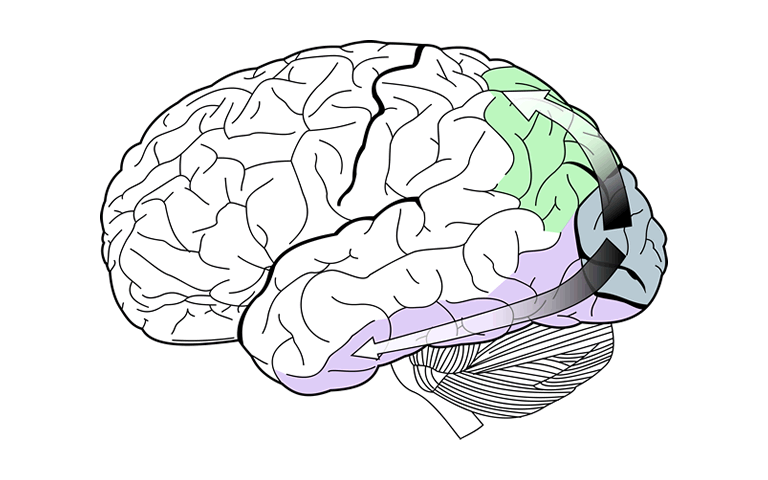 Kashino: On the one hand, the full scope of the brain’s workings has not yet been clarified. It is a general view that movement perception is processed sequentially in the dorsal pathway via V1. In fact, however, the information entered from the retina does not necessarily pass through V1, and there seem to be several pathways that go to the higher-order visual cortex, which processes movement perception directly from the superior colliculus and the lateral geniculate body. —Does that mean that in visual processing there are multiple shortcuts using bypass pathways? Kashino: Yes, that’s right. The information entering from bypasses is not very detailed, but it is transmitted quickly. Such information may be used to generate reflexive body movements. In other words, what we are thinking when first the ball comes flying from the pitcher and we hit it with the bat is something that comes after what has actually occurred. We are just retrofitting a story onto a past event. For example, when a batter hits a home run, then after the game in interviews the batter will say ’The ball stopped, and I could see it clearly.’ Of course, objectively speaking, the ball did not physically stop. But this expression is correct from a subjective viewpoint. And, the batter is thinking that he was able hit the ball because it stopped, and, in reality, he may feel as if he was able to because it seemed to him that the ball had really stopped. Actually, the batter’s assertion, ‘The ball stopped, and I could see it clearly is not unexceptional; he asserts that because that’s what happened when he was able to hit the ball, wasn’t it? A batter will also say, ‘The ball disappeared,’ when he strikes out. The ball does not disappear even if you swing and miss. The cause and effect relationships here are very complicated. The reason is that human beings, given a result, are able to use their brains to give an explanation of this result that makes sense. Even in purchasing behavior, when people are asked the reason why they chose B instead of A, experimental results have shown that it has come out that many people who answer, "B was cheaper and the performance was good," are just giving this answer to rationalize their behavior. They are retrofitting this answer onto their previous behavior. This kind of thing is being explained by brain science today. —That precisely is what we are unable to realize. Consciousness retrofits and reinterprets our experience to match it with the results that came about, and this is a process that we cannot be conscious of. So, we cannot directly experience this process. Kashino: That’s right. One more thing—illusion is greatly involved in how things look to us. In our daily lives, it may seem that there are not that many situations in which we are conscious of an illusion, but actually, the world we see is full of illusions. For example, have you ever heard of curve ball illusions? Let me show you an actual example. Please follow the ball straight ahead. The ball fell straight down, didn’t it? Now, please try to shift your line of sight sideways while tracking the falling ball. Please use browser that supports video tags. —Ah, the ball turns when you shift your line of sight. Kashino: Yes, this is an illusion reported by Shapiro’s group in 2009. The ball's trajectory itself does not change in the vertical direction, but, however you look at it, the trajectory looks bent. The culprits responsible for creating the bend are the movements of our eyeballs, and the difference between the visual appearance of our center vision and our peripheral vision. When we think like that, it also raises the possibility that with pitches such as curve balls, the batter's brain bends the trajectory more than the actual physical movement of the ball. It’s very interesting, but when you talk to professional baseball players, they say that the balls thrown by a pitcher actually appear in various, different ways、You hear things like a certain pitcher’s slider bends up, or that pitcher’s fast ball gets bigger and bigger as it approaches, or conversely, the ball gets smaller and smaller and before the batter knows it, the ball falls in the catcher’s mitt, just like a magic pitch in a baseball anime. Such things are physically impossible, but as things that are felt subjectively, we can explain it as something created by an illusion. For example, the former Chunichi Dragons pitcher Masahiro Yamamoto did not throw especially fast pitches, but according to some batters, ‘Masahiro ‘s pitches were the fastest.’ They said, ‘It feels like the ball floats up from the ground, and it is extremely hard to get a handle on.’ One reason is probably that in comparison to the ball speed, the number of revolutions the ball makes is proportionately larger, so that the batter feels that the ball is rising up. Also, his unique pitching form must have driven batters who tried to predict the ball crazy. Yamamoto's pitching style is completely different from the style batters study to learn about a pitcher's motions, and his pitches behave quite differently from what batters study about normal ball behavior. In short, our saying that the ball is fast or slow, or that the pitcher's control is good or bad is not something that is influenced only by whether the ball was hit or not. An important point is for the pitcher to fool the batter’s expectations. However, these expectations are in the end still something brought about by the workings of an unaware, implicit brain. Even though you know something with your head, your body does not move as you want it to. —I see… using illusions, such as making motions that seem to fool the batter’s expectations … I understand now that to improve your technique in a sport, it’s important to be familiar with the characteristics of illusions.